Harthacnut, sometimes referred to as Cnut III, was King of Denmark from 1035 to 1042 and King of England from 1040 to 1042. He was the son of King Cnut the Great (who ruled Denmark, Norway, and England) and Emma of Normandy. When Cnut died in 1035, Harthacnut struggled to retain his father's possessions. Magnus I took control of Norway, but Harthacnut succeeded as King of Denmark and became King of England in 1040 after the death of his half-brother Harold Harefoot. 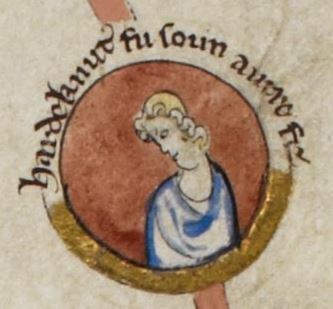 Harthacnut had suffered from bouts of illness even before he became King of England. He may have suffered from tuberculosis, and he probably knew that he had not long to live. In 1041 he invited his half-brother Edward back from exile in Normandy and probably made him his heir. He died suddenly in 1042 and was succeeded by Magnus in Denmark and Edward in England. He was the last Scandinavian to rule England.